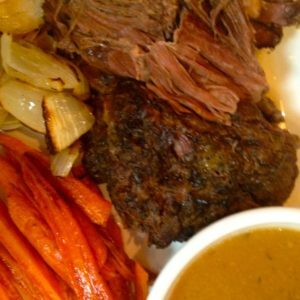 Beef roast, cooked with your slow cooker in Guinness stout for robust flavor and mouthwatering tenderness is a dish you’ll crave any time of year. Spring may be right around the corner, but you won’t care once you’ve taken a bite of this Irish beef stew. 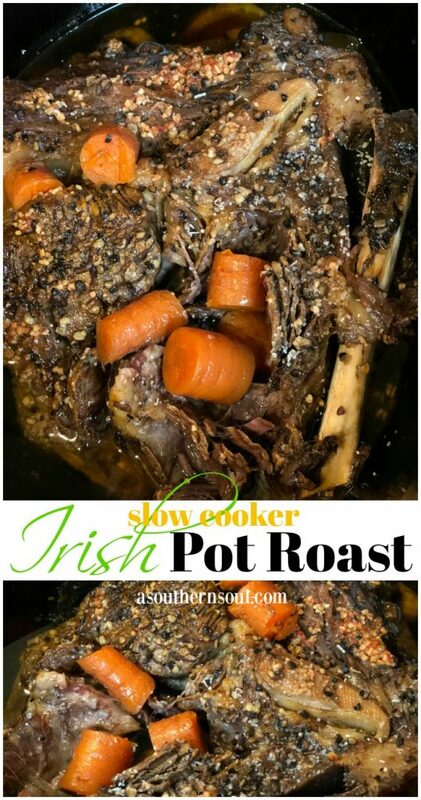 I have several different pot roast recipes and they are all good but, I think I’ve found my pot of gold with this combination of ingredients. This past weekend, I decided to try something new, in honor of my Irishman, Mr. A Southern Soul. 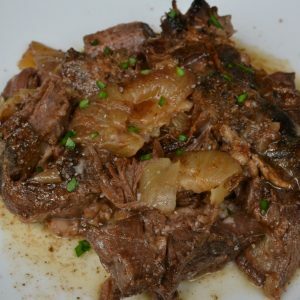 I had thawed a big, beautiful chuck roast and had been scheming about what to do with it. 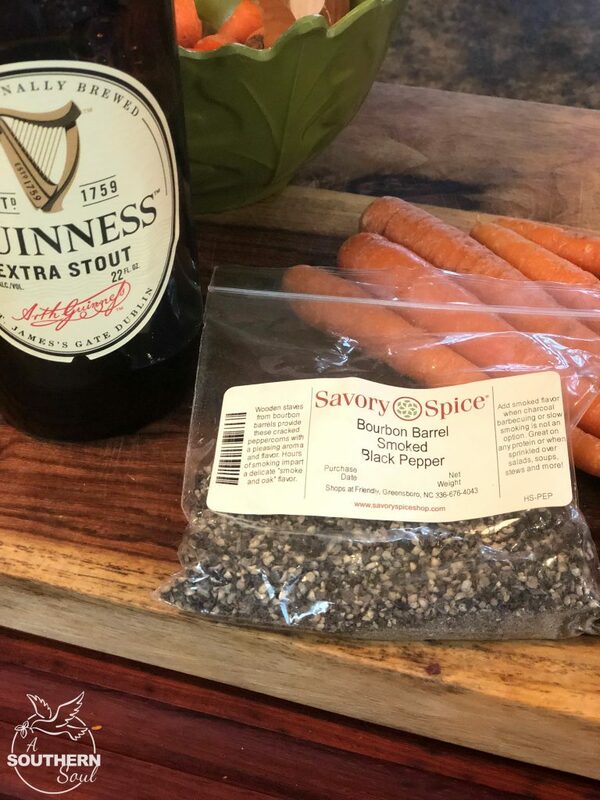 With St. Patrick’s Day a week away and that being my man’s birthday, I decided to try adding Guinness Stout as my one of the key ingredients to my dish. I knew that the stout would give the meat a smooth flavor while tenderizing it. 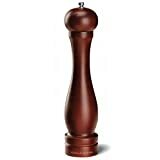 The next key flavor I added was black pepper but not just any black pepper. Several weeks ago, my oldest son, surprised me with a bag of Bourbon Barrel Smoked Black Pepper from our local spice shop. I was taken with it’s flavor from the first time I used it. It’s slightly spicy and has a distinct smokey aroma that makes any beef dish outstanding. 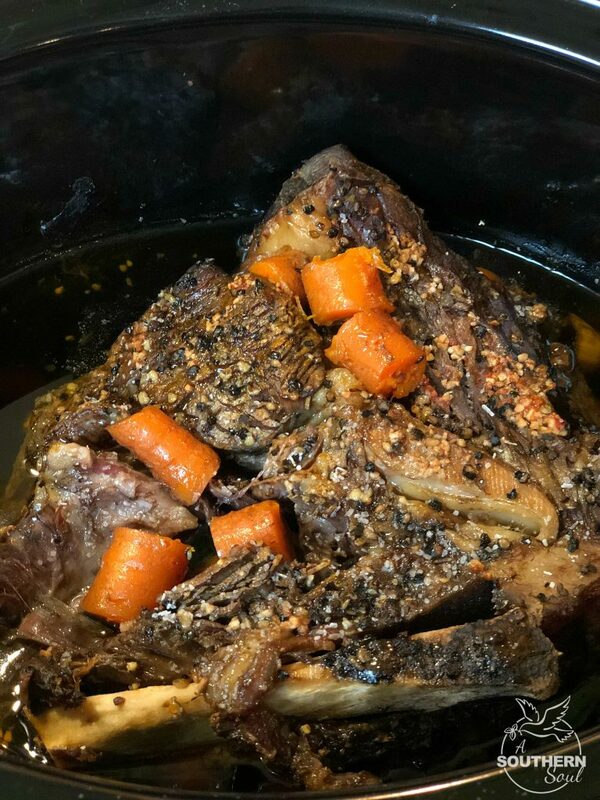 Like most of my other slow cooker, roast recipes, I added onion, carrots, garlic, some concentrated tomato paste and salt. That was it. Simple and straight forward. 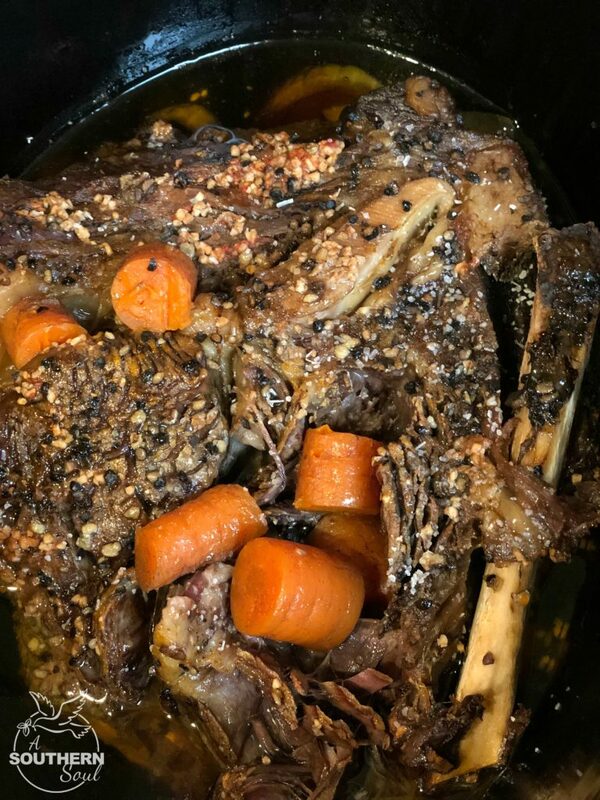 After about 8 hours in the slow cooker, I had an incredible beef roast that I new my guy was going to love. This is one dish that you’ll be happy to serve any night of the week yet special enough for entertaining. Oh, and don’t forget…St. Patrick’s Day, too! Place sliced onion in bottom of slow cooker. Add beef roast on top of onion and scatter carrots around sides. In a small bowl, add Guinness stout, tomato paste and garlic. Mix well. Pour over beef. Sprinkle over salt and pepper. Place lid on slow cooker. Set controls on low for 8 hours. When beef is done, slice and serve. 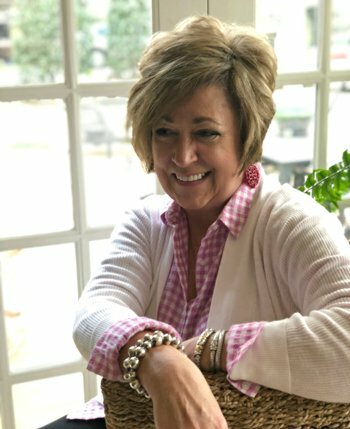 Want more recipes from A Southern Soul? You can get them delivered right to your mailbox by subscribing. Thanks! WOW! this roast looks wonderful. I will have to try this but as I don’t like beer nor do I ever have it on hand (there’s a long story about my aversion LOL!) , I’ll just have to find a substitute. I usually use apple juice for the beer. Anyway as usual, you have shared another phenominal recipe and I thank you! Please don’t think I am criticising your recipe, it’s just the beer, but everything else looks and sounds superb. Thank you again Donya for all the hard work you put into your blog. It’s one of my very favorite blogs I subscribe to. Update. 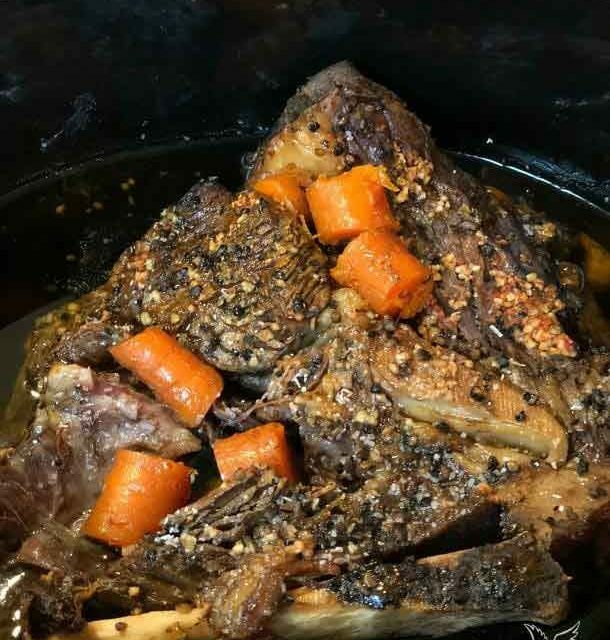 I made your Irish Pot Roast and substituted apple juice for the beer and it was wonderful. There wasn’t any left and everyone raved about it. 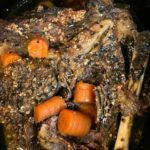 I was asked to give the them recipe and I gave them your web address and told them they could get it there and also look at all the other great recipes your site has. Thanks again for your great recipes. I’ve yet to not like anything I’ve tried. Claudine, I am humbled and so thankful we’ve connected. Thank you so much for sharing these sweet words. WOW! 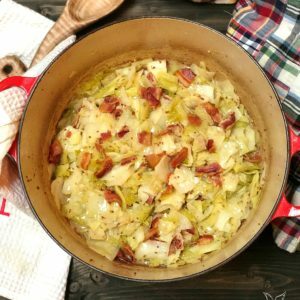 I love how you put your own twist on the recipe. I am excited that you shared my site. I promise I’ll keep the recipes coming, and hope you’ll keep close and cooking with me.